It’s 100 years since the Representation of the People Act (1918) passed into law, bringing with it full voting rights for men, and partial voting rights for women. As part of this landmark year, we delve into Manchester’s rich local history – from the Suffragettes to the Chartists – exploring familiar voices, and some that you may never have heard before. Expect comedy, plenty of politics and Manc pride, as CYC reflect on history and the possibilities for the future. Please note that this show contains strong language and sexual references. Review provided to Manchester Evening News by Amanda Dunlop. Presented by Contact Young Company and People’s History Museum, in association with the Museum of Science and Industry. This event is supported by the National Lottery through the Heritage Lottery Fund. Part of Wonder Women Festival 2018. Please click the link to download the SBTD Education Pack. 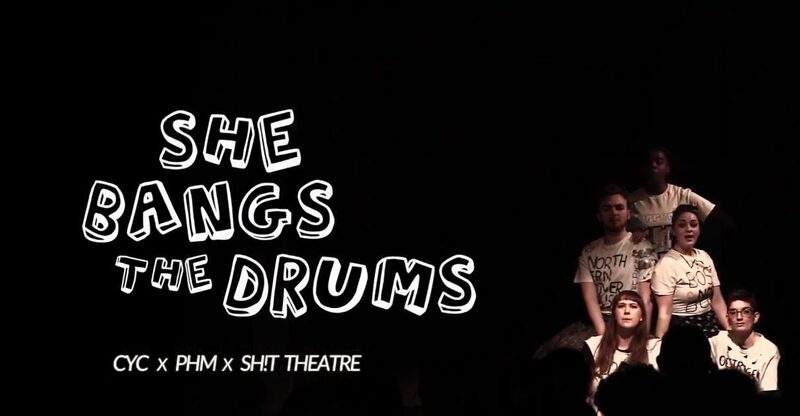 Caitlin Gleeson interviews members of the cast and creative in team in this podcast about the making of She Bangs the Drums. A selection of original music from the production by Sarah Sayeed and a group of young female musicians.